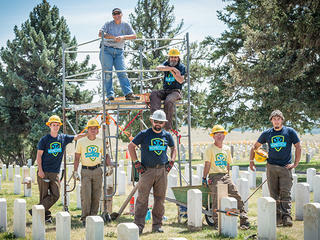 The Montana Conservation Corps took on an unique HOPE Crew project in the Custer National Cemetery at Little Bighorn Battlefield National Monument. The project was the first to take place at a National Cemetery, and the work focused on cleaning, resetting and repairing headstones within a specific section of the site. 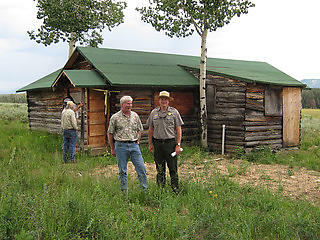 More than 5,000 armed service veterans, and their loved ones, are buried at the site in Crow Agency, Montana, with graves dating back to the 1876 Battle of Little Bighorn. Many of the headstones, however, were in serious need of repair, and doing so would be no small task. The work at Custer National Cemetery was the first to feature a crew comprised entirely of armed service veterans. 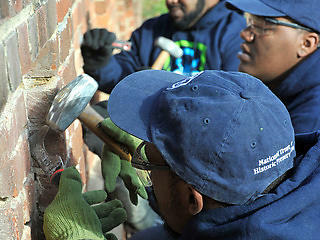 Under the guidance and supervision of staff from the Park Service's Historic Preservation Training Center, these veterans had the opportunity to not only learn valuable preservation masonry skills, but were also able to give back to fellow veterans from nearly a century ago.